Dr. Bruce W. Dearstyne is a historian in Albany, New York. 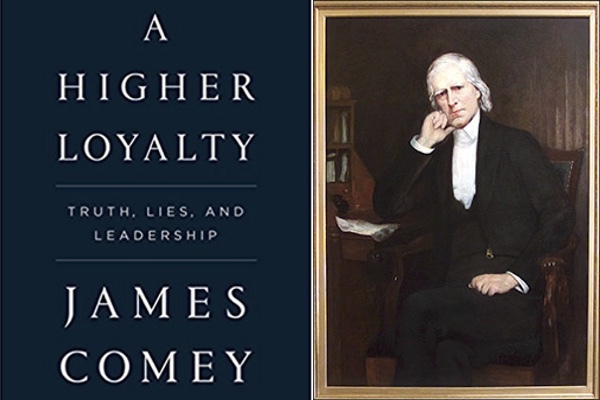 His latest book is "The Spirit of New York: Defining Events in the Empire State's History"
Former FBI director James Comey, fired last year by President Trump, is promoting his new book A Higher Leadership: Truth, Lies and Loyalty. It portrays Trump as a deceitful bully who was alarmed by Comey's investigation of Russian interference in the 2016 presidential campaign. There are parallels with William Duane, the first cabinet member in American history to be publically fired. Andrew Jackson, one of Trump's models as president, fired Duane in 1833. In 1832, Jackson vetoed a bill to continue the operation of the Bank of the United States, a private company chartered by the government, on the grounds that the Bank benefitted only the wealthy and had supported his political opponents. To speed the Bank's demise, Jackson ordered Secretary of the Treasury William Duane to remove federal government funds from the bank and transfer them to selected state banks. Duane refused, citing the need for congressional approval. Jackson pressured him, even sending his nephew, Andrew Jackson Donelson, who lived in the White House and functioned as presidential advisor and behind-the-scenes troubleshooter (somewhat similarly to Jared Kushner today) to warn Duane to carry out the president's request. Jackson arranged for a friendly newspaper, the Washington Globe, torun stories critical of Duane. None of it worked. On September 23, 1833, Jackson sent Duane a curt note that said "your further services as Secretary of the Treasury are no longer required." But William Duane did not go quietly. Instead, like James Comey, he went home and began writing. Duane published two memoirs to tell his side of the story and disparage Jackson, "Letters Addressed to the People of the United States in Vindication of His Conduct" in 1834, and "Narratives and Correspondence Concerning the Removal of the Deposits and Occurrences Connected Therewith" in 1838. The first book consisted of a series of open letters to the public along with excerpts from Duane's correspondence with Jackson. Duane did not mince words. "When I was rudely thrust from office" he had decided to remain silent and "to rest upon my acts as an officer and my reputation as a man." But Jackson's public statements on the deposit removal controversy after the firing had misrepresented Duane’s views. The president had selected and made public passages from Duane's letters to him to buttress his criticism. "Parts of my correspondence and conversations have been used, in order to infuse foul suspicions respecting me." Citing "a duty to myself, if not to the public, to present, in detail, my reasons for resisting the President" and asserting that "I have been grossly slandered, with the sanction of the President," Duane made his case. Jackson asserted that Duane had eagerly sought the Treasury position. Duane documented that actually Jackson had sought him out and had to persuade him to take the post. He had been "allured from my home and business" and promised that he could "exercise the discretion conferred on me as an officer by law." Jackson assured Duane he wanted his frank advice. "Remember, I do not wish anybody to conceal his sentiments," Jackson told him. "I give you my views, you give yours; all I ask is that you will reflect with a view to the public good." But Duane's suggestions that Jackson reconsider his fund removal proposal, seek congressional authorization, or at least refer the matter to the courts, were spurned. Duane argued that Jackson's proposal to transfer funds from the Bank of the U.S. to designated state banks was "arbitrary and illegal." He believed the president and the Treasury secretary lacked the "authority to create a sort of charter" or "a right, in any way, or for any time, to bind the United States" to a scheme to deposit funds to the state banks. But Jackson was determined to "trample on the law itself." Moreover, Duane explained, the state banks were unregulated and could act recklessly: "the anxiety to make money, the ignorance, or the imprudence of particularly remote, local banks" would tempt them to make bad loans and that could lead to a "great commercial convulsion." "Upon whom would reproach, in such events, be cast? Not on the banks, but on the secretary of the treasury," Duane insisted. Duane came to realize that some other members of Jackson's cabinet and Jackson's unofficial advisors, whom historians often call the "Kitchen Cabinet" for their occasional meetings with Jackson in the White House kitchen, were conspiring to undermine him. They constituted "an influence at Washington, unknown to the constitution." In addition, "rumor [was] particularly agile in Washington," some spread by the President's political friends. Duane concluded that Jackson's "crafty advisers determined to make me their instrument, or else to effect my removal from office." One of Jackson's claims after he fired Duane was that he had secretly supported continuation of the Bank. That infuriated Duane. "What can be a more serious charge, than to say, that, under the mask of friendship, I entered the cabinet to thwart the President, and favor an institution, which I professed to oppose?" Duane asked. "Yet serious as this imputation is, it is sanctioned by the chief magistrate." Duane explained he had supported the Bank charter renewal veto – the Bank had forfeited all "claims to favor" because of the "weight of complaint against it" – but he had drawn the line at pulling out the deposits, which, he was certain needed congressional authorization. Jackson kept pressuring while at the same time reassuring him that "in making to you ... this frank and explicit avowal of my opinions and feelings, it is not my intention to interfere with the independent exercise of the discretion committed to you by law over the subject." But it soon became apparent that Jackson expected Duane to do the president's bidding, resign, or be fired. Duane had determined that "I could not execute it without detriment to the public and reproach to myself." But who would win the battle for public opinion? Duane's persuasive "Letters Addressed to the People of the United States"helped encourage Jackson's opponents. Jackson had appointed his friend, Attorney General Roger Taney, as Duane's successor as Treasury Secretary, an appointment made when the Senate was in recess. Taney moved the deposits as Jackson wanted. But when the Senate returned to Washington in 1834, it refused to confirm him, and he had to give up the office. Jackson's opponents orchestrated a resolution of censure in the Senate that asserted that by removing the federal deposits, the president "has assumed upon himself authority and power not conferred by the Constitution and laws, but in derogation of both." Jackson, humiliated and enraged, worked to get the resolution expunged, finally succeeding just before leaving office in 1837. The next year, 1838, Duane published his second book, "Narratives and Correspondence Concerning the Removal of the Deposits and Occurrences Connected Therewith." By then Jackson had retired but his successor, Martin Van Buren, who had served as Jackson's Secretary of State and Vice President (and may have helped undermine Duane), was dealing with the indirect fallout of the deposits removal and demise of the Bank. The "great commercial convulsion" Duane had predicted had descended on the nation in the form of an economic depression that began in 1837. Disappointed that Congress had not stopped Jackson or at least carried out an inquiry, and resentful of continuing criticism by Jackson partisans, who were "exciting suspicions as to the purity of my motives for resisting him," Duane had secured copies of all his correspondence with Jackson from friends in the Treasury Department and reproduced much of it in the book. "Narratives and Correspondence"lacked the fervor, tone of vindication, and impassioned accusations of betrayal of the public trust that had marked "Letters Addressed to the People of the United States"four years earlier. But the Duane-Jackson correspondence and other documents gave readers – and later, historians – insight into how the tense discussions played out. Some of the long documents are substantive if not exciting reading. For instance, a key letter from Jackson to Duane on June 26, 1833, laying out his perceptions and plans, takes up twenty pages of small print in the book. Duane's reply of July 10 takes up eighteen pages. The reader can sense both men digging in, their positions becoming more rigid, prospects for compromise fading. But Duane makes an extensive case in the book for Jackson being arbitrary and headstrong, being egged on by his advisors, ignoring pleas for caution, and caring little for the law. Duane's first book, published about a year after he was dismissed, and Comey's book, published about a year after hewas fired, are both examples of books published in time to level public criticism at the presidents who fired them. Duane and Comey both come across as principled public servants, and Jackson's arbitrary style is comparable in some ways to Trump's. Duane and Comey both present documentation in their books – letters, in Duane's case, and notes that Comey created after meetings with Trump, in his case – which corroborate their view of events. Duane and Comey both refute their respective president’s explanation of why he fired them. Jackson partisans attacked Duane much as Trump partisans are savaging Comey these days. Books help shape public opinion. Books by fired political insiders like Duane and Comey can dent the reputations of even the most powerful presidents.